Nutritious and delicious, this crunchy bake is a source of calcium, rich in niacin and suitable for those on a gluten-free diet. Makes a fun and flavourful family meal. 1. Preheat the oven to 200ºC, gas mark 6. Place the risotto, chicken, sauce, paprika and 100ml hot water in a small ovenproof dish and stir well together. Bake for 30 minutes until the chicken is cooked through with no pink meat. 2. 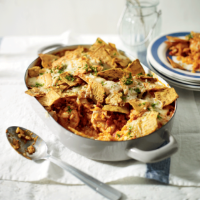 Sprinkle three quarters of the cheese over the chicken then break up the tortilla chips and scatter over. Sprinkle over the remaining cheese and parsley, then bake for a further 5 minutes until the cheese has melted and the tortillas have browned a little at the edges. Cook’s tipYou can use a 250g pouch Waitrose Microwaveable Long Grain Rice in place of the frozen risotto in step 1.